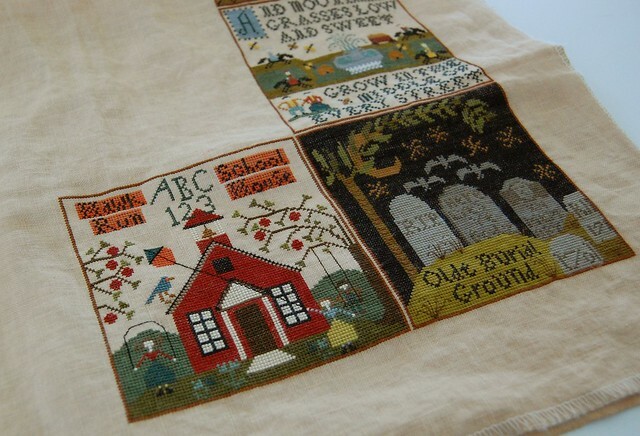 Hawk Run School House, a photo by Nicole's Needlework on Flickr. I got block 11 finished up the other day! Hope you all had a fun Halloween. My boys were all ninjas. They had a blast. I also wanted to say how sorry I am for those who suffered damage and power outages during Sandy. I hope all is repaired and restored soon! Really pretty, Nicole, but I do love the Olde Burial Ground! Your project looks terrific. I want to stitch some Hawk Run projects... maybe in 2013. I think they're all just gorgeous. Looks great, Nicole! Makes me want to start mine soon!! Love the colors in this sampler. Beautiful worked square you finished. It's such a cute block, isn't it? Well done! Looking good! I love the colors! Such a beautiful design. I love the colour of the schoolhouse!! Oh wow--this is great! You inspire me Nicole-you stitch so many gorgeous things so quickly! It looks so pretty, Nicole! You go girl--you're making great progress. Wonderful progress! Love this block.